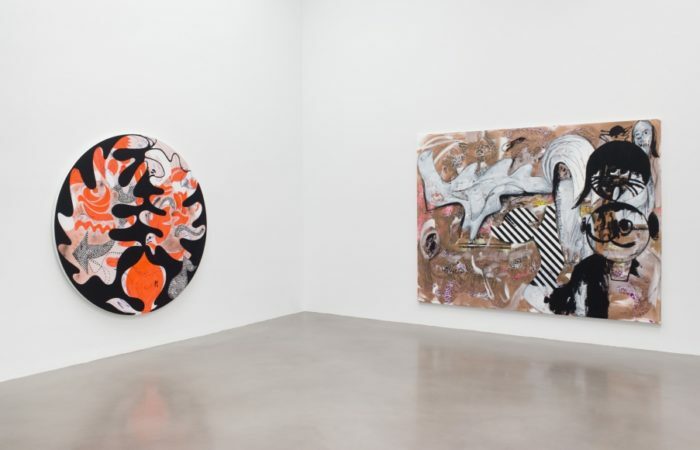 Charline von Heyl: New Work at Petzel Gallery, installation view. 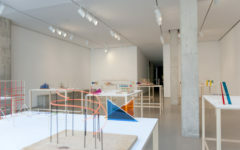 Image courtesy of Petzel Gallery. 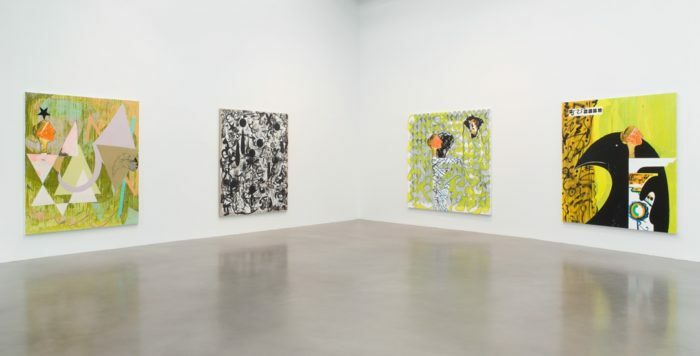 Charline von Heyl has compared painting to chasing a dog on a leash. In the presence of any one of her large-scale tableaus at Petzel Gallery, a viewer can only do the same. Von Heyl combines, torques and frames rigid shapes, images of objects, animal and human figures, patterns and motifs, paint drips and scribbles into something like collages of subconscious signals. 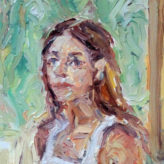 Like some other contemporary painters, she plays with the syntax of picture-making, inventing images that deal more in dramatic possibilities than in actualities. I am accustomed to asking what a painting is. Von Heyl proposes what a painting can do. 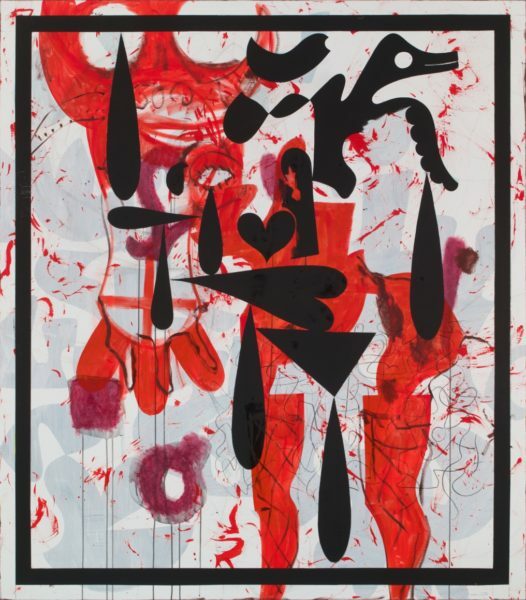 Charline von Heyl, La Vache Qui Rit (The Laughing Cow), 2018, acrylic and charcoal on linen 80 x 70 inches. In the back room of Petzel I am staring at large canvas titled “La Vache Qui Rit,” French for the laughing cow, a moniker that may or may not be a reference to that brand of cheese-to-go (the painting’s predominance of white and red supports this theory). The drama takes place on a sheer white ground (masking a puzzle of shapes) within a square black frame so rigid it could be a photoshop element. Within are black hearts, teardrops, triangles and silhouetted twists which rise the geometric bird-like form that could have been pulled from a decorative sampler. Beneath the black shapes are masses of blood-red and bruise-magenta. As my eye moves from the lower right toward the upper left I see the silhouettes of legs, what might be a bow, the top of a skull, and an upside-down coat of arms. I catch myself interpreting these ambiguous forms as objects, and in so doing become aware of my own viewership. I see myself seeing. A black teardrop shape sits below two open white circles of the skull’s eye, and it looks like crying. I notice another face: an elongated horizontal heart at center becomes the mouth to a hollow eye drawn in charcoal slightly upward to the left. Von Heyl’s paintings conjure up different associations depending on where you look. Perhaps the graphic shapes in “La Vache Qui Rit” would not seem so free, so buoyant, had von Heyl not dabbed and flitted her brush in red across the canvas. In black, she has doodled a lattice across the leg shapes and made charcoal squiggles on top. One effect of these markings is to further enrich the painting’s tangled web of associations. On top of the red “scull” in “La Vache Qui Rit” for instance, two parallel dashes further evoke the hollow nose holes of an eyeless face. Charline von Heyl, The Flood subject, 2018, oil and acrylic on linen 86 x 82 inches. Such brushwork also relates the primal energy underlying von Heyl’s more explicit figures and shapes. Throughout the paintings, a cursory mix of drips or scribbles dance across the surface, sometimes contained by more sharply defined forms in the foreground. 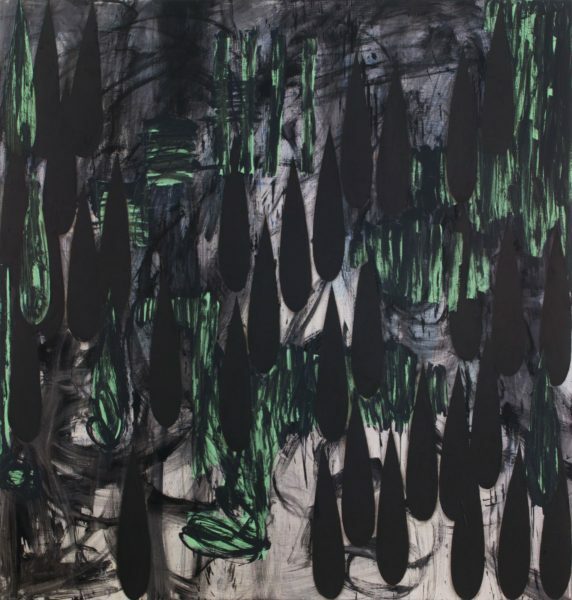 In “The Flood Subject,” black and lime green teardrop shapes, almost kitsch in their uniformity, emerge from a radio fuzz of black and blue marks. That drag-and-drop sampling of graphic elements could be read as a computer-era update to the expressive vocabulary of free-handed doodling that occupies much of the painting’s ground (think Baldessari in the jungle). Both the uniform shapes and the active brushwork suggest the importance of intuitive play, where poetic meaning is revealed from chance juxtapositions and guileless exertion. Uniting the associations of images with the rhythmic associations of paint drips, scribbles, and strokes, von Heyl’s paintings are both haptic and cerebral, both self-evident in their formal unity and charged with inscrutable meanings. Charline von Heyl, Mana Hatta, 2017, oil, acrylic, charcoal on linen, 82 x 70 inches. Wondering where the human subject fits into all this, I see an answer in “Mana Hatta.” In the painting, the silhouettes of two heads appear to overlap, intercepting each other, as well as forming a base for evocations of radio waves and signals. From the hypnosis-eye of the figure at left toward the bottom of the canvas, cartoonish waves meander through black, red and blue. These patterns are overlaid by three outlines of jumping rabbits, punctuated by little stamps of red. No explicit reference is made to Alice in Wonderland, but between the leaping rabbits and target circles for eyes such an association is appropriate. The sort of fetish von Heyl describes, associated in some cultures with voodoo, has its origins in the Portuguese “feitico,” or sorcery, derived from the latin facticius, meaning “artificial” and “facere” to make. Here I admit my ignorance about the actual ritual uses of so-called fetish objects, yet the etymological history of the term is itself revealing. The origins of “fetish” both in “sorcery” and in making confirms a reality that is familiar to many artists: that the medium has a mind of its own. A hallmark of a good painting, or a good image, is that it seems to look back. Von Heyl’s paintings so adhere to their own internal laws that I can imagine them telecommunicating to one another after the gallery lights are off. Charline von Heyl, Poetry Machine #1, 2018, oil, acrylic, charcoal on linen, 82 x 78 inches. 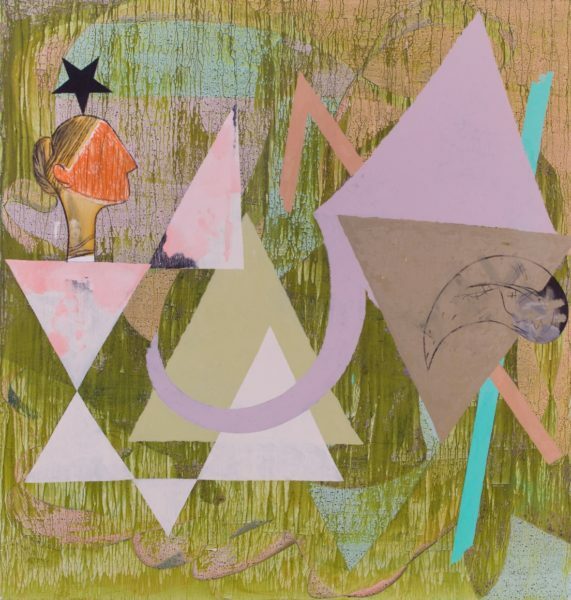 Von Heyl’s paintings are strange, compelling new realities. Yet one flip side of their originality is that they are extremely particular, as fetishes, including the sexual kind, tend to be. I want to think that because von Heyl’s paintings are radical and interesting they are also necessarily great, but viewing them only takes me so deep. I felt alienated in the presence of some of her images, either due to the crypticness of their signs (such as “Poetry Machine”) or because of the thinness of the pictorial space. The painting “Corrido,” for instance, selected for the gallery’s front room, left me cold. The work features a black antler shape at the center opening to checkers, layered over decorative motifs and patterns. I wouldn’t say I didn’t like the painting: I liked the hot orange beside the cool yellow, the white drips over black. But the exuberance of the decorative motifs felt spectral and hollow, like garlands from a neoclassical statue framing nothing. My identification with the painting’s theatre of effects was disproportionate to the grandeur of the massive canvas. 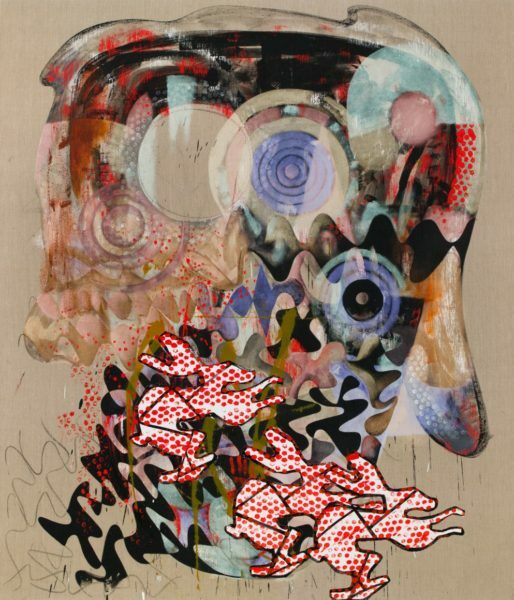 Still, Charline von Heyl’s work is compelling me to ask new questions, even to re-consider how painting can mean today. 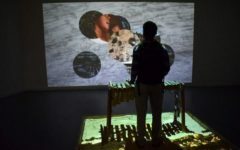 It is true that I didn’t jive with “Corrido.” Yet, like all of the works comprising the exhibition I am compelled by my own uncertainty regarding how to see them. Her works ask for repeated viewings, for considering and re-considering. One visit to Petzel and some 1,000 words later, von Heyl’s paintings are still pulling me by the leash. 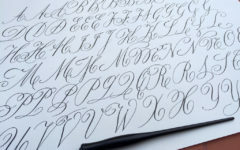 Kate Butler is an artist and writer living in Brooklyn, NY. 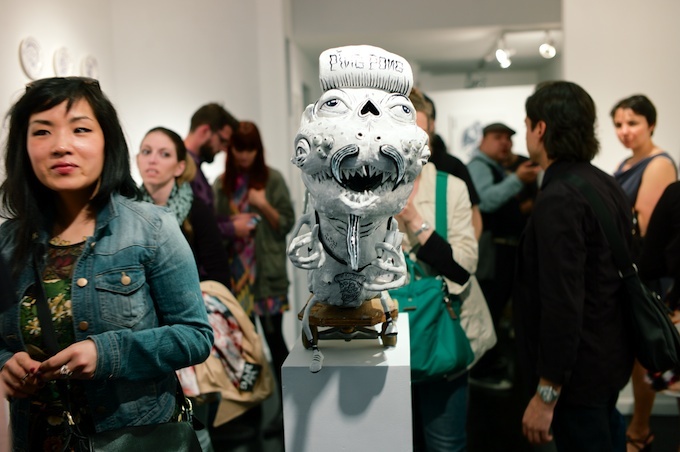 She is currently earning her MFA in Fine Arts/ MA in Art History at the Pratt Institute. See her work at www.katembutler.com. I am impressed with the breath of composition and execution of her works. Each painting looks so singular as if they were created at different stages in the artist career.